February 2019 Note: The city has said that this event may be cancelled if the 2 organizing groups don't get together...so check first whether it is still on for 2019. The Mazatlán International Motorcycle Week (Legendaria Semana De La Moto) happens ever year starting the Wednesday following Easter and ending 5 days later on the Sunday. 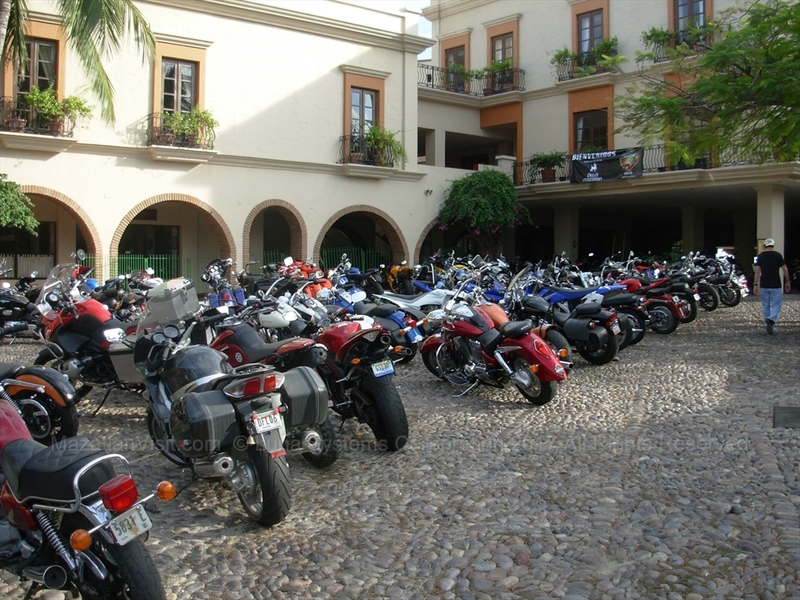 Thousands of motorcycle enthusiasts from Canada, the United States, Mexico, and other countries ride to Mazatlán. During the week, there are many organized events that take place. The events include concerts, beach parties, freestyle shows, regional tours, stunt rider competition, biker girl competition, tattoo competiton, bikini competition, and after hours parties! For 2019, the Mazatlán International Motorcycle Week takes place from April 24, 2019 to April 28, 2019. This is the 24th annual! The 2019 schedule of activities has been released. Note: The below schedule is subject to changes without notice! 5pm - 5:30pm: De California y Rodino -Tribu M.
1:30pm - 2:30pm: De California y Rodino -Tribu M.
Where is the Plaza de la Moto? Where can I get more information about the Mazatlán International Motorcycle Week? For 2018, the Mazatlán International Motorcycle Week took place from April 4, 2018 to April 8, 2018. Wed Apr 4: registration, DJ Nhas, live rock, welcome, Los Buckets, Dynassty, Retro DJ party, and an after-hours party at Joe's Oyster Bar. Thurs Apr 5: rural ride, freestyle show, DJ, Live rock, Sinaloa Banda, groupo Estalar, La Rezaka, and an after-hours party at Joe's Oyster Bar. Fri Apr 6: regional ride to El Quelite, extreme off-road ride, beach party, DJ Nhas, Costumes, Tattoo contest, bikini contest, freestyle show, custom bike/biker chick, stunt riders, Homenaje a los ciados sicarios del rock, banda estelar, La Rezaka, and an after-hours party at Joe's Oyster Bar. Sun Apr 8, official store is open, DJs, standup comedy, and an after-hours party at Joe's Oyster Bar.